Eva is one of an exciting young generation of chefs who are bringing back influences from their travels around the world and igniting the Sligo food scene. Originally from Tuam, her family moved to Rosses Point where she still lives, when she was in her teens. She inherits her passion for good food from both parents. Her father was a well known chef in his day at Cré na Cille Restaurant in Tuam. Her mother is an artist and an excellent cook. As a tot she would dress up as a chef, wearing strawberry punnets on her head in place of the chef’s hat. Her career beckoned! She took a segue first however, spending a year studying Social Care in Dublin, but working part time as a chef (it paid better than waitressing!). Leaving that behind she spread her wings, moving to Australia with her then partner, where she stayed for four years. 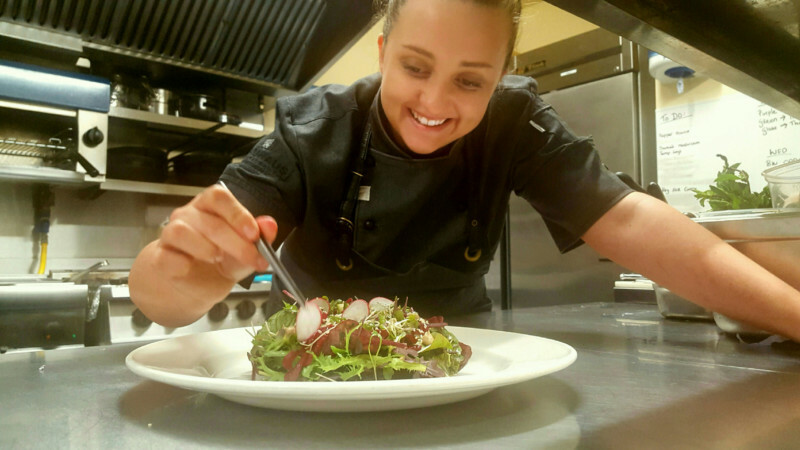 Eva made the most of her time in Sydney, first training as a chef in Culinary Arts and then studying Hospitality and Business Management. As if that wasn’t enough, needing a trade to qualify for a visa, she spent a year as a butcher’s apprentice. This led to a wonderful experience travelling all over Australia with a couple of Irish entrepreneurs seeking to introduce Oktoberfest to the Antipodes. Eva’s employer was commissioned to supply the food and they made a good job of it – Oktoberfest is still a firm fixture on the Australian calendar. Returning to Ireland, she took up her first Head Chef post at Harry’s in Rosses Point and led the team to a bumper season, their best ever. Food presentation is very important to Eva, and something she excels at, no doubt inspired by her artist mother. Her activity on social media connected her with some noteworthy chefs including Stefan Hartmann who had earned a Michelin star in Berlin and was setting up a new venture in Vancouver, Canada. When he offered her a job she jumped at the opportunity and with typical enthusiasm, flew out on Sunday and started work on Monday! From there she was head hunted to David Hawksworth’s restaurant in the Rosewood Hotel Georgia, one of the top 50 restaurants in the world. Come summer, Eva was back on the plane to take up the reins again at Harry’s in Sligo. She has a habit of landing gigs in great kitchens – as a student she had a placement with Neven Maguire in MacNean’s Bistro. A chef’s life is a busy one and these days Eva hasn’t much time for hobbies but she used to love rugby and played for Tuam and in Australia on a semi-professional level. Now, her focus is on an exciting new culinary venture in Sligo, working with Galway chef John Quinn. She is also actively involved in Sligo Food Trail’s upcoming Harvest Feast where she is taking charge of one course in the company of other top Sligo Chefs. She loves the camaraderie and networking opportunities this gives, something busy chefs so often miss out on.